These are perfect paired with raspberry semifreddo in Chocolate and Raspberry Heart Napoleons. Cut parchment paper to fit a 9-by-13-by-2-inch pan. Brush vegetable oil in corners and center of the pan, pressing parchment to adhere it. Set aside. Bring a medium pot of water to a simmer. Place chocolate in a medium stainless-steel bowl; place the bowl over, but not in, the simmering water to melt the chocolate, about 4 to 6 minutes. Remove chocolate from simmering water. Thoroughly dry bottom of bowl; a drop of water will ruin the chocolate. Pour chocolate into prepared pan. Using a large metal offset spatula (angled blade), spread the chocolate evenly over the surface 1/16 inch thick. Freeze until chocolate sets, about 6 minutes. 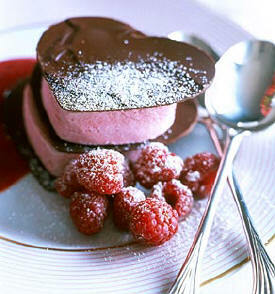 Working quickly, use a heart-shaped cookie cutter (3 1/4 inches across at widest point), to cut out six chocolate hearts. If chocolate begins to soften, return to freezer for several minutes. Run an offset spatula under the hearts, and place in a container. Cover and freeze until ready to use, up to 2 weeks.